With a solar backpack you can charge all your handheld devices while you are on the go. I found this to be quite interesting. 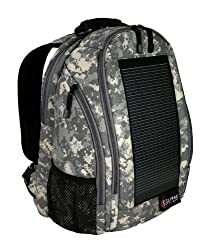 The suns energy is stored into a small battery inside the backpack which in turn can charge your phone in a couple of hours to full charge. There things are cool! If you are on the go and are looking for a way to keep your ipod, ipad, laptop, or phone charged then check these things out here!